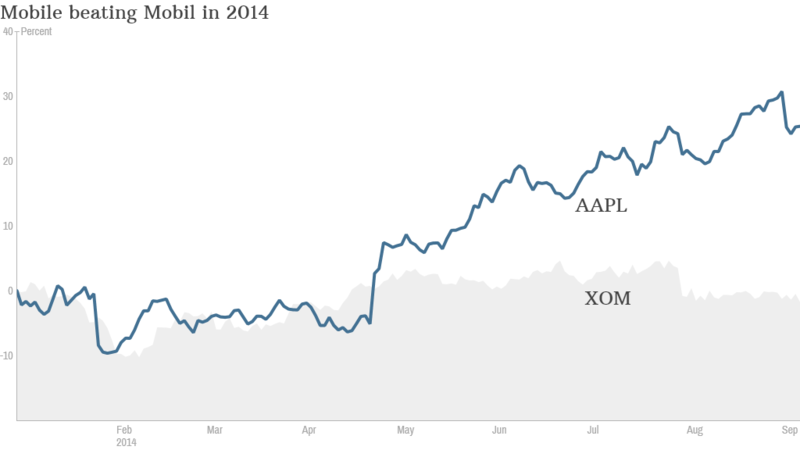 Apple or Exxon stock: Which is a better buy? Apple or Exxon: Which is a better buy? 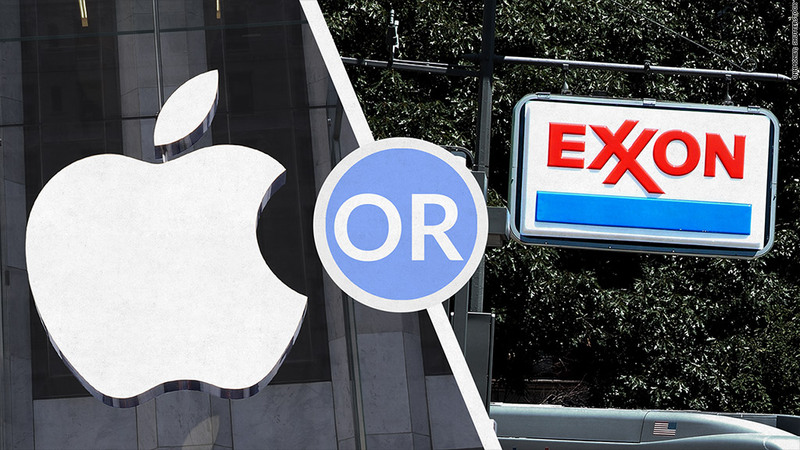 Should you buy Apple or Exxon? The stock price of Apple and Exxon Mobil are both just under $100. So if you had 10,000 pennies lying around and wanted to buy just one share of these two icons, which should it be? What stock would you rather own? It's tempting to end this story right now and just say Apple (AAPL). The world's most valuable company is about to release a new iPhone and is widely expected to be debuting a smartwatch and mobile payment system at its big event in Cupertino on Tuesday. Shares of Apple are up more than 20% this year and are near an all-time high. The company clearly has its mojo back. Who'd want a sleepy oil company when you can own the center of the iUniverse? Exxon Mobil (XOM), the second most valuable company on the planet, isn't exactly a dog. Sure, shares are down a little bit this year as crude prices have retreated and investors have shown concerns about declining oil production. If you do a "tale of the tape" for the two stocks, they actually look pretty similar. Let's get ready to rumble, Wall Street style! The oil giant is the cheaper of the two stocks. But not by much. It's valued at about 12.5 times earnings estimates for 2015, while Apple trades at more than 14 times fiscal 2015 earnings forecasts. Both companies have strong balance sheets and reward shareholders with dividends. But the yield edge goes to Exxon. Its dividend yields about 3% compared to 2% for Apple. Analysts are predicting annual earnings growth of nearly 13%, on average for Apple, over the next few years, according to FactSet. Exxon is also expected to grow earnings at a double-digit clip too -- analysts are estimating 10% growth for the next couple of years. At the end of the day, both stocks are attractive. If you really can't decide, you could spend $200 bucks to buy one of both ... or one share of the SPDR S&P 500 (SPY) exchange-traded fund. Apple and Exxon are the two largest hodings in that index ETF. Plus, you'd also get exposure to other market heavyweights like Microsoft (MSFT), Google (GOOGL), Johnson & Johnson (JNJ), General Electric (GE) and Warren Buffett's Berkshire Hathaway (BRKB). I also asked followers on Twitter what they would buy if they only had $100. Here are some thoughts from the social media world. Take a bite out of the Apple! "$aapl because the possibilities of tech are limitless whereas $xom deals with finite resources," wrote @sid_dudheria. "Oil! Smartphones is a forever changing market. Oil is long term, more reliable," said @Nece_89. $AAPL will outperform this product cycle bc of iPhone, $XOM is a long-term growth story," tweeted @realjohnducas. "xom is for people with one Benjamin, aapl for those with spare benjis," said @adolfoyanes. "I would day trade #aapl ahead of the announcement. I would buy #xom for a longer investment," added @rtaborn. But -- to quote the late Dennis Hopper in "Speed" -- what do you do? What do you doooooo? Vote in our poll that's featured higher up on the left-hand side of this story.